One word summary for the book- “PosituforPostivus”. I’m going to call this one of the Best User’s Guide to Life. It’s a recommended book for everyone, even if you say you’re 501. If your response is “I read it when I was the young age of five” then allow that same kid to re-read and revive! And you know that you have a different perspective from back then, so get the darn book and read it again! Thank you Dr. Seuss for the inspiration to much of my life. 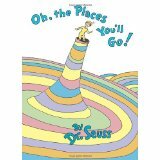 This entry was posted in Book Reviews, Daily Blogs and tagged Don't stall and wait, Dr. Seuss, Fear, Keep moving, Momentum, Positivity, the Places You'll Go by MomentumMikey. Bookmark the permalink.